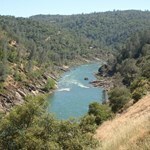 The North Fork of the American River is designated as a while trout water. 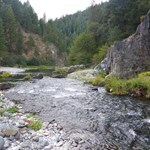 Most of the North Fork flows through a deep canyon carved through metamorphic rock. It has a very rugged character with very steep slopes and a narrow bottom. Deep pools framed by sheer cliffs, waterfalls cascading from 40 to 70 feet, and benches, densely wooded with alder and willow are typical of the beauty found in the North Fork Canyon. 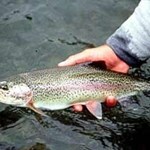 The fishery is dominated by Rainbow trout, with an occasional Brown trout (the brown trout are usually lunkers!). 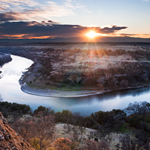 Fishing enthusiasts can choose from a number of trails to access the river canyon, most of them dropping steeply from the canyon rim down to the water. While visitation peaks in the summer, primarily driven by hikers/swimmers, late spring into mid-summer is typically the height of the boating season. The highest boatable reach is known as Generation Gap (12 miles), run by only the most experienced Class V boaters, which can only be accessed by a three-mile long walk. The next lower reach, known as Giant Gap (14 miles), is also Class V and is accessed by a two-mile hike down the Euchre Bar Trail. Although overnight camping permits are not required, if visitors want a campfire, they will need to obtain a fire permit. 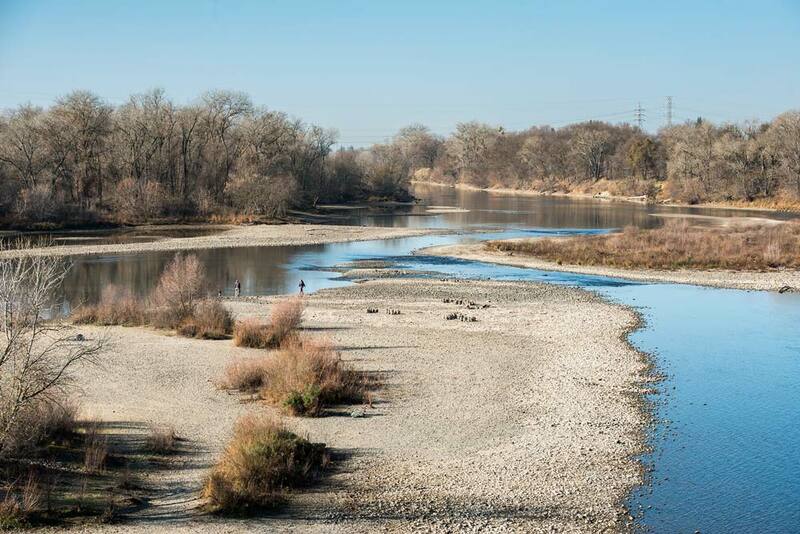 The Lower American River is a short stretch of river, flowing through the city of Sacramento, is the most heavily used recreation river in California. 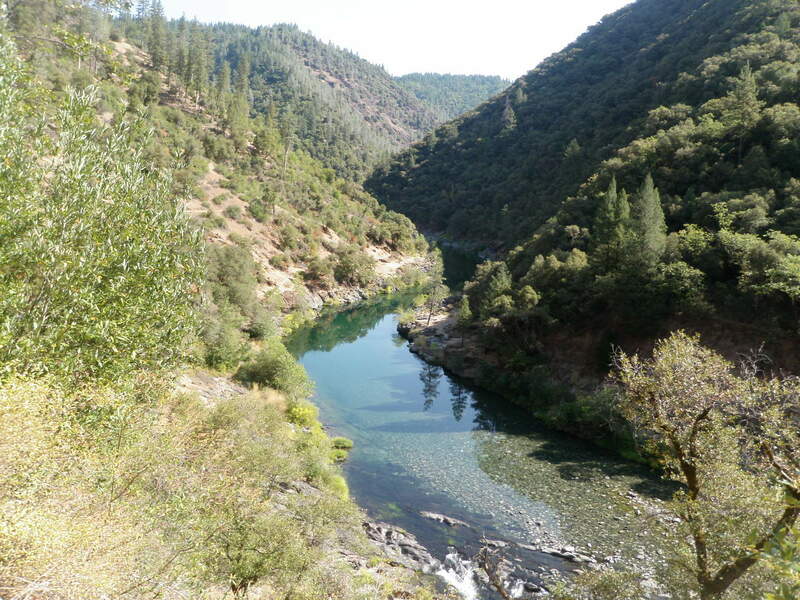 It provides an urban greenway for trail and boating activities and is also known for its runs of steelhead trout and salmon. 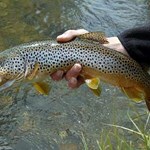 We fish the Lower Sac year-round for trout. 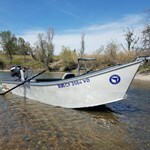 We fish the river from drift boats, typically floating from 6 to 15 miles in a day. Although the nymph grab is good all year, the best times ... morefor consistent mid-day dry fly fishing are March-May and September-November. We also do a lot of swinging flies with lightweight spey rods. 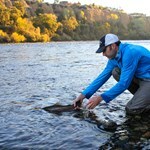 This is a great way to fish the shallow riffles. The shad are finally gone, YYEEEEESSSSSS!!!!! This means that its time for striper fishing again, and it has been getting better over the past few weeks. We are seeing the typically ... moreshakers, but a few bigger fish from 3-7lbs have been hooked as well, this will continue though Sept and is a great half day trip. We are also getting into a good number of half pounders and if you are in the right place at the right time you will hook a few adults pushing 6lbs. Personally I love this time of year for a few reasons, during the week there are few rafters on the water and you can target both stripers, steelhead and even salmon (if they are in) in the same day with some good success. Great time of year to swing your light weight 2 handed rods and in the evening throwing dries can be epic. All in all, a great time of year to be on the American, crowds are gone and fishing is pretty good. As fall approaches its only going to get better. 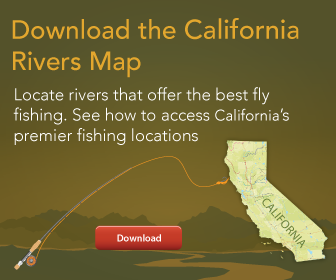 With our local waters finally at fishable flows (the American River is at 6400), its nice to be fishing close to home and on some good to great fishing. Summer is going to be good ... moreand our Fall should be great. 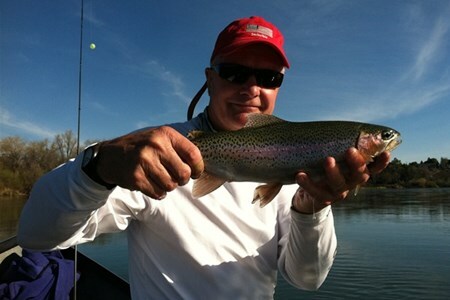 The AR has been a sight for long driving eyes as its been fishing great for both shad and stripers. Most of the shad fishing has been up top from Rosemore up, as well as the crowds. But if you can get out early, you will miss the crowds and be off before it gets too hot. 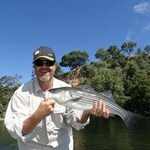 Also there are some huge stripers cruising up top but getting them to eat is another story. My striper trips have been from Sunrise down for full days, and Gristmil down for half days, and boy has it been good! We are seeing a ton of shakers, and in the mix are plenty of 2-5lbers. 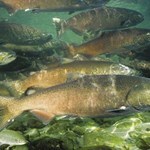 The big fish unfortunately are stuffed with shad right now, but those smaller fish will keep you busy. We are having some good top water action too if you can get on early enough, and plenty of fish to go around whether a full or half day, 1 or 2 anglers. 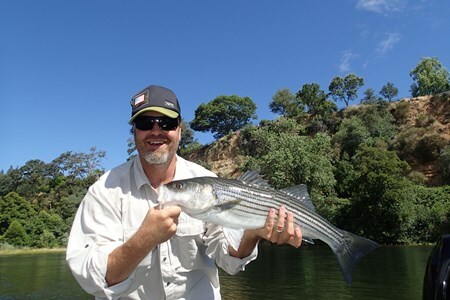 As the shad start leaving the river, the striper fishing will only get better. Best way to fish for stripers is on early off early, get your fix and beat the heat. No better time than now and the next few months. Time to get your 8wt bent. 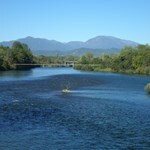 This is the one river that has recently surprised us. Both myself and Tom recently went out in search of Steelhead, Striper and Shad and we were pretty happy with the outcome. Now ... morewe didn't find any steelhead, but we have the Feather for that, the shad are slowly making there way in, as far up as Gristmil, but the numbers are not great yet, but if you put in your time you will get a few. Give it another week or so and shad fishing should be really good. With the nice high flows, this should be one epic shad run, nothing like hooking 20,30 even 40 fish in just a few hours, and the fight is nothing but incredible. Now lets talk about the Striper fishing. 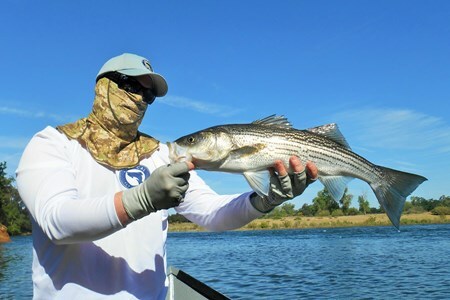 We found many willing stripers to eat our flies from 16" to 7lbs, with many grabs, some nice ones to the boat and many big ones seen swimming around. 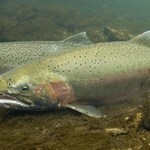 Even though its "NOT STRIPER TIME" yet, now is the time to target these bruisers on the fly before it gets to crowded. 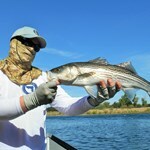 We are using 8wt rods throwing 350gr striper lines and our special clousers to get the job done. 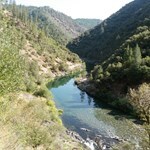 Want to get into some fishing without the drive for fish that pull like Mack trucks, look no further than the American River. 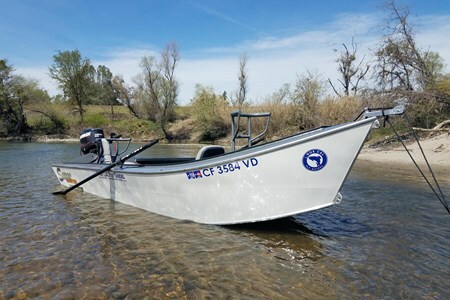 Dates are already filling up in June for shad and striper trips, and with very few days in May, time to think about your next trip.